Sports are measured in numbers. Games are determined by inches. Clocks run out. Close only counts in horseshoes and hand grenades. Americans are always keeping score. 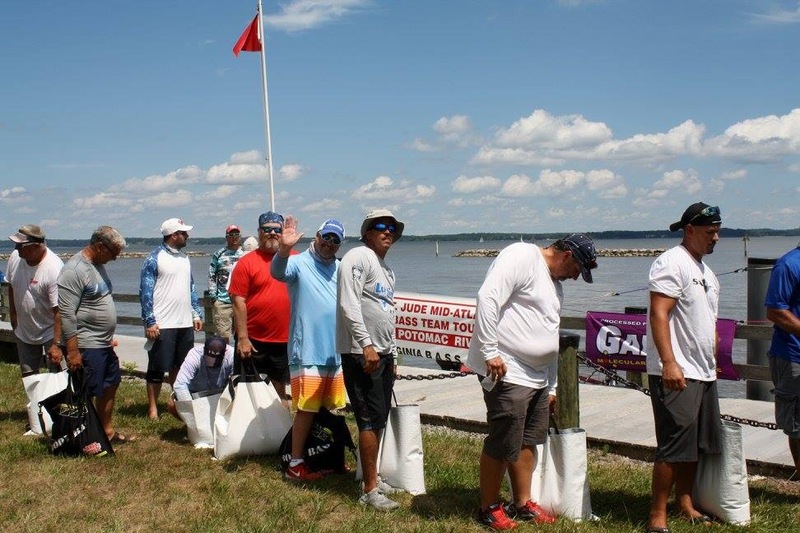 On 7-7-17, 127 anglers took to the waters of the Potomac and by the end of the fishing day; they raised $6,820 for the kids of St. Jude Children’s Hospital. This might not seem to be a lot, but there were more than 2 times the participants this year. This was the 22nd tournament. Going back 20 years, Viacom DC radio General Manager Charlie Ochs listened to one of his managers make a pitch for the country music radio giant WMZQ to enhance their fundraising efforts for St. Jude Children’s Hospital. The program Director and Sales Manager at the time were solidly opposed to a bass fishing tournament. They didn’t like the image fishing presented, at least in their minds. They felt the bass fishing demographic didn’t suit their demographics. Charlie heard them out and then took off his glasses and became Sargent Ochs. His eyes lit up and he asked if they knew anything about bass fishing. Charlie wasn’t a bass fisherman, but knew they bought boats, trucks, and tackle and made every Middle America purchase. He also knew they had families and made donations to worthy causes like St. Jude. Consensus was reached and here we are more than 20 years later. Amazingly, there are a few guys who fished the original event who continue to show up and bring others to the tournament. This event is like no other competition. Oh sure, there are a few gunslingers seeking prize money, but there are others like the Pyles brothers who in 2016 donated their winnings right back to St. Jude. This gathering of local bass anglers includes some of the best fishermen on the river along with avid anglers who just want to take a Friday off to support the kids. And support they do by showing up and opening their hearts and their wallets. Events like this are enhanced by corporate sponsors willing to donate products to show support for St. Jude Children’s Hospital and of course the anglers. Long time sponsor Hanz Extremity Wear has provided their line of waterproof socks and gloves for nearly the entire run. Jack’s Juice Bait Spray has been there too with samples, hats and shirts for the contestants. BoatUS also joined up over a decade ago, providing useful swag, like cooler bags, lanyards, and key floats. They also toss in towing packages. The support of GAMMA Fishing line is also very much appreciated, donating line for just about every angler; braid, fluorocarbon or copolymer. Water Gremlin supplies split shot weights. Newcomer 13 Fishing, rod and reel maker, jumped at the opportunity to participate. They donated a dozen rods for bass fishing and a few for crappie. Others also support the event. St. Jude Children’s Hospital is a worthy cause. At a cost of $2.4 million per day to operate St. Jude, the kids rely on public contributions to provide more than 75 percent of the operating funds. Insurance only provides 14% and 9% comes from grants. Most hospitals generate more than 90% of their revenues from insurance recoveries and other sources. St. Jude, the second largest health care charity in America according to the Chronicle of Philanthropy’s Philanthropy 400 list and the 11th largest charity on Forbes list of the 200 largest U.S. charities, has consistently been in compliance with the Council of Better Business Bureau’s Wise Giving Alliance. The American Institute of Philanthropy, as well as financial rating agency Moody’s and Fitch have also rated St. Jude favorably. But more importantly, St. Jude changes the way the world understands, treats and defeats childhood cancer and other deadly diseases. Finding cures and saving children is their mission. Sharing treatments invented at St. Jude have helped to push the overall survival rate for childhood cancer from 20% when the hospital opened in 1962 to more than 80% today. Families never receive a bill from St. Jude for treatment, travel, housing or food. What was behind the dramatic increase in this year’s tournament participation? Was it the decent weather? Maybe that the Potomac River is yielding plenty of quality size largemouth bass. Perhaps it was the publicity generated via social media. All valid possibilities. But, after talking to each and every participant, it turned out it was the kids, the brave kids who put up the fight of their lives, that got everyone to take a hot Friday off to participate in their battle. These anglers didn’t ask for thanks. They just wanted to know when the 23rd Annual St. Jude Children’s Hospital Potomac River Open Team Tournament would be so they could show up again, in record numbers. Water is hot! Best to get out early to get a topwater bite. Start with a Lucky Craft G-Splash 80 popper. Use 14 pound test GAMMA Copoly or 30-pound test Torque braid. Look for clear water when there is water over the grass. With low water, Mann’s Super Frogs on 60-pound Torque braid will get big ones to come up. Twitch over clumps and pause in holes. Find a cadence that works. This will work all day when water is low. As for tides, move into the grass as the tide rises. Mann’s Baby 1-Minus covers water. Also Mann’s Stone Jig with a HardNose Mullet 3.5 inch trailer will cover water too, but deeper into the grass. Lift and drop and try steady retrieves. Also, Texas rigged Mizmo tubes on 16-pound test GAMMA Edge fluorocarbon with Mustad 3/0 Mega Bite Tube hooks can be pitched to holes in the grass. Soak soft plastics in garlic Jack’s Juice Bait Spray. Polarized Maui Jim HT sunglasses help to locate targets.